We’d love your help. Let us know what’s wrong with this preview of Magazine of Fantasy & Science Fiction, March/April 2016 by C.C. Finlay. Published February 28th 2016 by Spilogale, Inc.
To ask other readers questions about Magazine of Fantasy & Science Fiction, March/April 2016, please sign up. "A Mother’s Arms" by Sarina Dorie deserves a nomination. Loved the novellette A Mother's Arms by Sarina Dorie and Golden Gate Blues by Janes L. Cambias. Also, take a look at the novella by John P. Murphy - The Liar. As always I turned to Charles de Lint's Books to Look for (Thank Gaia for this column) and Kathi Maio's movie review that this time covers: The Potato Farmer who worked the Problem. Guess who? This magazine never fails me. It's the one that when it arrives in the mailbox, I actually feel glee. A lot of the stories were average to good, A Mother's Arms by Sarina Dorie was fantastic. I think it's worth going out of your way to read. Good/Fair. Hewell, a postal inspector from London, makes a trip to Binderwood to investigate some irregularities in the mail. He finds an overlapping mail service. Good+. Old appliances have taken refuge in a nearby park. One steals Renee's phone. She's not too worried about the phone, but the case was decorated with a pair of opals that she really regrets losing. She spends more and more time visiting the park getting to know its inhabitants. Better story if you are sympathetic to the appliances. OK/Good. Andrea is a scientist having troubles at work. Her daughter Natalie is searching for something spiritual, iarrthoir. Not too gripping, but a great ending. Very Good+. The New England town of Versailles has had at least one teenage death on November 5th going back nearly seventy years. When Pastor Julie asked Greg Kellogg to become sexton he learned this and began to investigate. Greg has the ability to create lies, e.g. light bulbs that stay lit, and tries to use his power to overcome this string of accidents. Good. The trickster Nanabojou goes to Virginia when he hears of legislation being made by the white men to classify races. Good/Very Good. Ifigenia is a linguist. Just before the mission with the Oloa, the ship runs into some space debris causing her to go deaf. She still accompanies the ambassador to the planet. While there she learns of a second race that has been enslaved and which is now fighting back. OK. Twist ending of Jackie Robinson breaking into the big leagues. OK+. An exploratory mission finds silver strands in the atmosphere. The more they see the strands the more it looks like they portray sentient behavior. Excellent/vg. An octopiller village is damaged by a fight between mothraflies and a sky beast. One octopiller mother lost all eight of her babies and wants revenge upon the sky beast. She finds a larvae inside and adopts it. Really touching story told from the perspective of the octopiller mother. "Red in Tooth and Cog" de Cat Rambo: une nouvelle qui débute de façon très banale, mais dont l'aspect science-fictionnel est ancré dans le quotidien, ce qui donne une force au propos. "A Mother's Arms", de Sarina Dorie: une belle adoption d'un point de vue extra-terrestre, avec des éléments caractéristiques à la fois cohérents et ancrés dans les émotions. Une belle réussite, une auteure que je compte suivre. "The ghost Penny Post" est intéressant, mais un peu longuet et nébuleux. "Belief" est très bien écrit, mais je ne comprends pas son appartenance au genre (bien que Nancy Kress soit d'abord une auteure de genre, cette nouvelle-là est dans le monde actuel, pas même de la mundane SF ou de l'anticipation rapprochée). "The Language of the Silent' est une histoire très bien sur les difficultés de communication et les rencontres culturelles, au personnage principal bien étoffé, mais l'élément perturbateur (perte de l'audition) ne cause pas de difficultés assez prolongées dans le temps, ou ce n,est pas suffisamment montré dans le texte. À un certain point, il faut se rappeler qu'elle n'entend plus, car les dialogues se poursuivent comme si de rien n'était. Les deux auteures (Wade et Finch) ont un bon potentiel, mais il restait du travail sur cette histoire. "Nanabojou and the Race Question" est une sorte de conte amusant, mais qui m'a fait me questionner sur les récents débats d'appropriation culturelle, ici l'utilisation de la culture amérindienne. "Diamond", comme "Belief", a un lien plutôt ténu avec le genre et m'a laissée indifférente. "Silver-Strand... Crucis-D" a une prémisse intrigante, mais l'écriture est trop technique/scientifique. J'aime bien la Hard SF, mais ça doit être bien intégré, ça prend trop de place ici. "Gloden Gate Blues" est une histoire amusante à la limite de la parodie, ayant lieu dans un univers de superhéros... mais ceux-ci sont absents de l'intrigue. Drôle et léger. "The Liar" by John P. Murphy - I enjoyed the small town New England setting and the set-in-his-ways bachelor main character. However, some of the character interactions felt off. I liked the lying knack, but thought its opposite wasn't really well integrated into the story. Finally, the mystery and its resolution didn't feel very satisfying to me. "The Ghost Penny Post" by Marc Laidlaw - Set in Victorian England, a strange shadow realm discovered by a postal inspector is the means for the story "The Liar" by John P. Murphy - I enjoyed the small town New England setting and the set-in-his-ways bachelor main character. However, some of the character interactions felt off. I liked the lying knack, but thought its opposite wasn't really well integrated into the story. Finally, the mystery and its resolution didn't feel very satisfying to me. 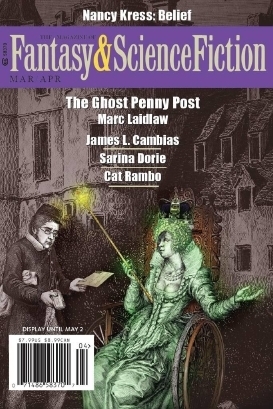 "The Ghost Penny Post" by Marc Laidlaw - Set in Victorian England, a strange shadow realm discovered by a postal inspector is the means for the story to make some observations about today's virtual or secondary lives like online RPGs or LARPing. The late introduction of another element made the ending seem rather bizarre to me. "Red in Tooth and Cog" by Cat Rambo - Fun and well played out premise. At the same time, it made me think about how attached we can become to things (especially tech stuff) and anthropomorphize them. Also, electronic waste is actually a growing issue if not exactly in this way! "The Language of the Silent" by Juliette Wade and Sheila Finch - This one seemed more like an excerpt than a stand-alone story and just left me feeling lost. There were some hints at interesting world-building if we had enough time to make more sense of them. "A Mother’s Arms" by Sarina Dorie - A fun and clever comparison of an alien prospective on humans with a mother's prospective on children. "Belief" by Nancy Kress - Not really a story. Just a reflection on having faith in only the tangible versus really knowing anything beyond. "Nanabojou and the Race Question" by Justin Barbeau - A history lesson told in a dryly humorous style as a Native American folktale. "Diamond" by Chris DeVito - Only thing speculative about this is that it hasn't quite happened yet. Also guessed the twist pretty early. "The Silver Strands of Alpha Crucis-D" by N. J. Schrock - This felt like it was trying too hard to be literary. So it was pretty but read more like a poem than a story. "Golden Gate Blues" by James L. Cambias - Veronica Mars in comic book world, but from Dad's POV. Definitely entertaining -- I'd like to see more episodes of this father and daughter PI team solving unusual cases. The Ghost Penny Post was an awesome take on a relatively new hobby. Red In Tooth and Cog was my favorite of the issue, probably. A very interesting and well-developed premise. Also, whether real or imagined for a pen name, Cat Rambo is a cool nom de plume. I'd actually thought it was the name of a story originally, lol. The Language of the Silent is one I would like to refer to my friend Oliver (if he reads this review) b/c it has to do with linguists. A Mother's Arms was a fantastic! In fact, in r The Ghost Penny Post was an awesome take on a relatively new hobby. A Mother's Arms was a fantastic! In fact, in retrospect, it comes very close to Red In Tooth and Cog for being my favorite for the issue. An incredibly interesting tale that takes many small but satisfying twists that makes it unique to a scifi reader. The Liar was a really cool longer story with a character whose interesting talent puts him in a unique position within his community. The Silver Strands of Alpha Crucis-D contains a good conundrum and some beautiful visuals. Golden Gate Blues was just all around awesome and would make a great adaptation for certain styles of pen/paper/dice rping. *Note: I keep my analysis purposefully light so that I hopefully don't give away details. Hope you read them, they're a great magazine! As always, some great stuff in here, and some that's merely average. Loved Sarina Dorie's "A Mother's Arm." A fantastic tale from a different POV--awesome stuff. And the author is a pretty cool lady! Solid issue. Lead story "The Liar" by John P. Murphy was particularly strong. I also enjoyed "A Mother's Arms" by Sarina Dorie and "Golden Gate Blues" by James L. Cambias. "The Liar," by John B. Murphy. 4 stars. Surprisingly good creature-feature novella anchoring this issue, not my usual thing. Awards: nominated for the John W. Campbell Award for Best New Writer (2003), the Hugo Award (2003, 2009), the Locus Award for Best Magazine (2016), the Nebula Award (2003, 2009), the Sidewise Award (2003) Sturgeon Award (2009) Editor: The Magazine of Fantasy & Science Fiction (fandsf.com).